In 2014, Mental Health Week will run from Sunday 5th to Saturday 11th October. World Mental Health Day is marked every year on the same date: 10th of October. Mental Health Week aims to activate, educate and engage Victorians about mental health through a week of interactive events across the state including an official launch, community festivals, art exhibitions, music, theatre and seminars. Click here for a list of Mental Health Week events in Victoria. With the end of the football season behind us, Monash Alfred Psychiatry Research Centre's A/Prof Steve Allen has written an article in The Conversation about the psychological journey of footy fans. Earlier this year two Monash medical students, Mr Jarrel Seah and Ms Jennifer Tang, won the Microsoft Imagine Cup for the development of an app, 'Eyenaemia'. 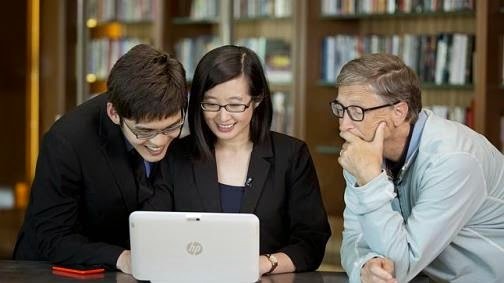 Now, as part of their prize, they met with Bill Gates, Microsoft's founder, for advice about how to progress further development and commercialisation of the app. Jarrel, a Central Clinical School student, is adding to his MBBS experience by doing a Bachelor of Medical Science in Honours. See the AFR article for more detail. This year the Central Clinical School postgraduate symposium is trialling a few new things. Firstly, we want to provide students with a more fun and informal setting in which to present their data. We encourage creativity so use videos, audio clips, animations, costumes, props…whatever you like! Tell us the story of your research, with great prizes available for the best oral presentations. There will be a prize for most creative oral presentation so bust out your best mouse onesie. Google+ Playbook Chapter 4 - Google+ Pages! Google+ Playbook Chapter 5 - Hangouts!